Your coach will meet with you individually to discuss your concerns about your specific role in helping your child grow up between homes and offer suggestions to improve the situation with your child's other household. 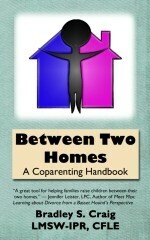 Basically, this is service is individualized coparenting education. The coach can help you recognize behaviors that may cause more conflict or make life more difficult for children growing up between two homes. Your coach can help you learn to replace unwanted behaviors with those that encourage more favorable transitions for your children. Your coach workswith you to assist you in becoming a healthy resource for your child, and these services do not extend to the your coparent. However, this service can be helpful to prepare you for cooperative meetings with your coparent, collaborative law meetings, or mediation. Rates are $200.00 per hour. Please plan on at least a three hour initial meeting. Please deliver each form separately via .pdf scan to brad@childreninthemiddle.com or fax (972) 704-2912. Once all the forms are fully completed and on file, an initial appointment letter will be sent to schedule the initial appointment. Because of the nature of court connected cases, it is important for us to maintain a written paper trail so phone calls will not be returned. If you have questions, please send questions in e-mail. Please do not send paper copies of information as we maintain digital files. If you mail your documents, you will be charged the rate of $200.00 per hour for time spent scanning documents in to digital format so you are encouraged to fax or scan your material. If a client or attorney requests a court appearance, deposition, or participation in any type of settlement conference by Mr. Craig there will be a minimum charge and deposit of three hours ($750.00) per day. If the court or both attorneys request a court appearance, deposition, or participation in any type of settlement conference by Mr. Craig, these fees are split unless otherwise addressed in the order. Once the deposit is received Mr. Craig will block of the time to appear. Please note: if an appearance request and the deposit is received without a minimum of one week notice the nonrefundable deposit is due immediately and there will be an additional $250.00 express charge ($1000.00). Failure to provide the nonrefundable deposit or at least 48 weekday business hour (Monday through Friday, excluding holidays) notice as specified constitutes release from the requested appearance. Deposits are nonrefundable unless cancelation of the appearance request is received by the requesting individual or attorney not less than 10 business workdays in advance. We have found that families that have attended coparenting education or read Between Two Homes have a greater success rate, better follow-through, feel more empowered, and utilize their time more effectively. For a listing of notices and general disclosures of business relationships please go here.